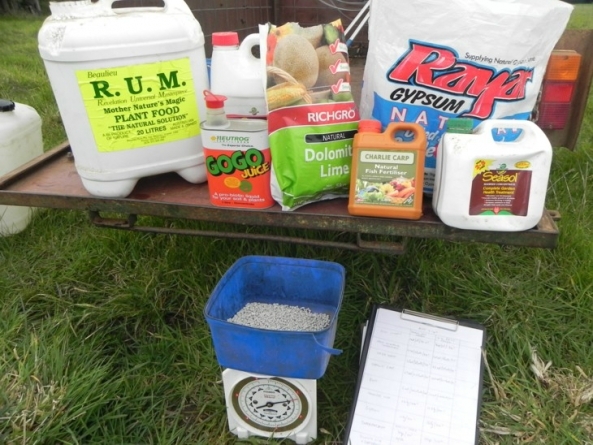 Every second or third year I like to trial some conventional and unconventional fertilisers, soil ameliorants and soil biological stimulants. Soil health on Moffitts Farm is moderate to good across indicators such as soil organic carbon, nutrient levels, pH and easily recognizable biodiversity such as earth worm numbers. The best indicators pasture growth and livestock carrying capacity confirms this. On Moffitts Farm we have not applied any inorganic fertilisers since 2000 and in 2009 applied one tonne per hectare of composted feedlot manure to half the paddocks. We have not seen any negative changes in paddock carrying capacity as a result of this strategy, what has had the most noticeable impact on pasture growth is the amount of seasonal rainfall. In 2013 we had average rainfall through spring and pasture growth was prolific. Despite this I decided to run the trial in a paddock I considered the perennial grass dominant pasture was not performing as well as in other paddocks. In perennial grass dominant pasture with high surface organic matter loads, nitrogen deficiency is common. I am not convinced it needs to be artificially corrected using nitrogen fertilisers but I was interested to find out if a response could be produced, figure 1. Figure I. 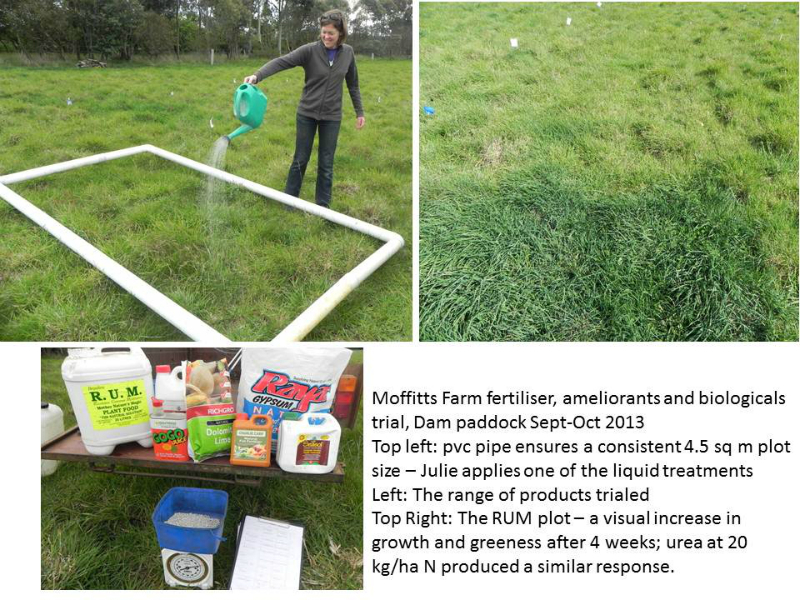 2013 pasture nutrients and ameliorants trial on Moffitts Farm. 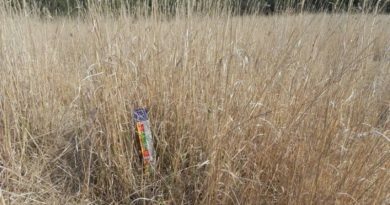 All were applied to 4.5 square meter plots at recommended rates for pastures and at a four times rate. 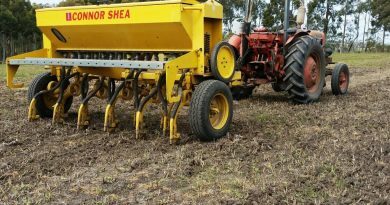 The trial commenced on 25 September two weeks after the paddock was grazed down to around 2000 kg green dry matter per ha. Treatments were applied in the morning of a day predicted to have heavy rain, this happened and 40 mm fell in the afternoon and night following application. By mid-October two products R.U.M. and urea produced visual responses in the form of darker green pasture and extra pasture growth. There were no visual changes in any other treatment plots. The fact that the responses occurred in urea plots at 20kg N per ha and 80 kg N per ha is not surprising, but the R.U.M. response was. It contains only 15% N or at the rate applied, 15 litres/ha, 2.25kg N per ha. R.U.M. presents a conundrum because it contains both free living nitrogen fixing bacteria as well as nitrogen so it is impossible to know which component produced the visual impacts, maybe it was both. 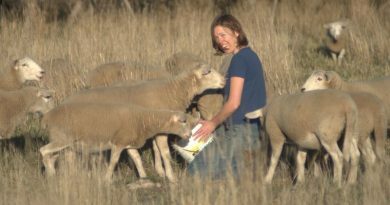 R.U.M is not generally applied to pastures as it is too expensive at around $100 per hectare for the recommended rate. The dolomite lime and gypsum treatments were not expected to produce a response in the spring, they may have an impact after the autumn break in 2014. The lack of response to biological products highlights the importance of knowing the key indicators for a vibrant and active soil food web and when it is why adding additional microorganisms or biological stimulants is unlikely to have an impact at the recommended commercial use rates. There will be soils especially those continuously cropped and subsequently significantly degraded in terms of structure, nutrients and biology that will benefit, but under perennial pastures combined with holistic grazing management such responses are far less likely. The alternative fertiliser trials I reviewed in 2013 (see soil health section on web site) all produced variable and even negative responses to biological products and conventional inorganic fertilisers compared to controls (not applying anything) despite manufacturers claiming they will produce positive production outcomes. The other point to remember about additives is that even if a response is generated in a pasture, is it commercially useful? The nitrogen response we saw was of little or no value this spring as the untreated pasture continued to grow prolifically (despite being less green) because rainfall continued through November. 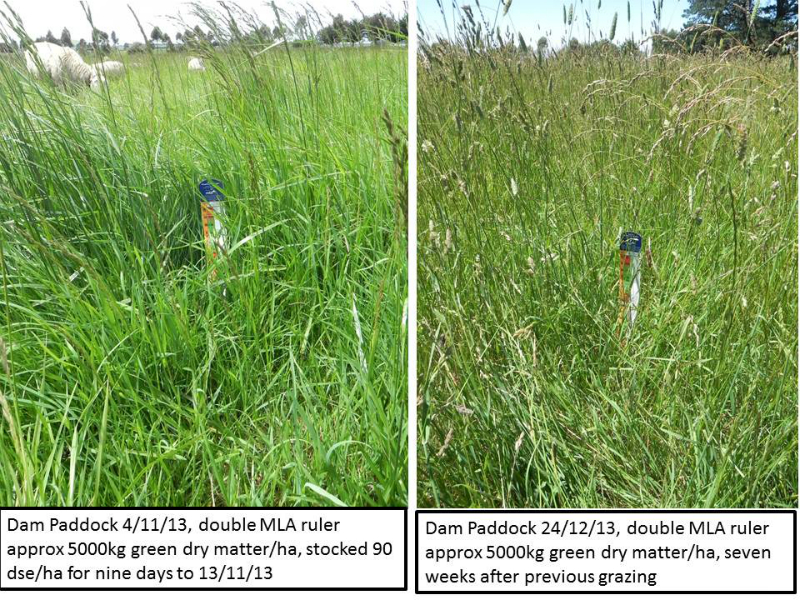 By mid-December paddocks rested from grazing for six weeks had recovered to 4000kg green leaf dry matter per hectare (below the seed heads), figure 2. Figure 2: When productive, summer active perennial grasses are combined with adequate nutrition and food web, high growth rates are possible well into summer when average rainfall occurs. Note the ruler in the photos comprises two units stuck together so green leaf height is around 20 – 24 cm. I will keep the plots going through to winter 2014 to see if any of the treatments produce a response after the autumn break. What surprises me is how few land managers actually do their own trials of anything; If they fertilize or spray, they fertilize or spray the entire paddock. It’s so simple to leave small areas untreated and I’m quite sure this would provide them with lots of interesting examples of where their additional inputs were a waste of money.